In August of 1958, in front of a Harlem brownstone, first-time photographer Art Kane assembled 57 of the greatest jazz stars of all time and snapped a picture that would live forever. Narrated by Quincy Jones, this "irresistible" (Kevin Thomas, Los Angeles Times), Academy Award-nominated documentary examines the fascinating lives of the musicians who showed up that day to make history. Through remarkable interviews with nearly 30 jazz greats (including Dizzy Gillespie, Sonny Rollins and Art Blakey), home movies shot by Milt and Mona Hinton, and rare, archival performance footage, A Great Day in Harlem tells the story behind a legendary photograph that is still alive and kicking - and jammin'! Hours of New Special Features! 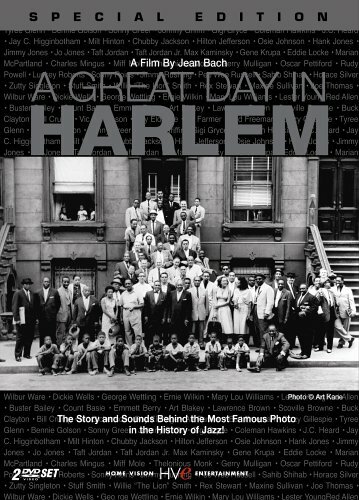 "Art Kane" Featurette "Bill Charlap and Kenny Washington" Featurette "Copycat Photos" Featurette "Stories from the Making of A Great Day in Harlem" Featurette PLUS: Bonus 2nd Disc Includes Over Two Hours of New Video Profiles of the 59 Musicians involved in the photograph!